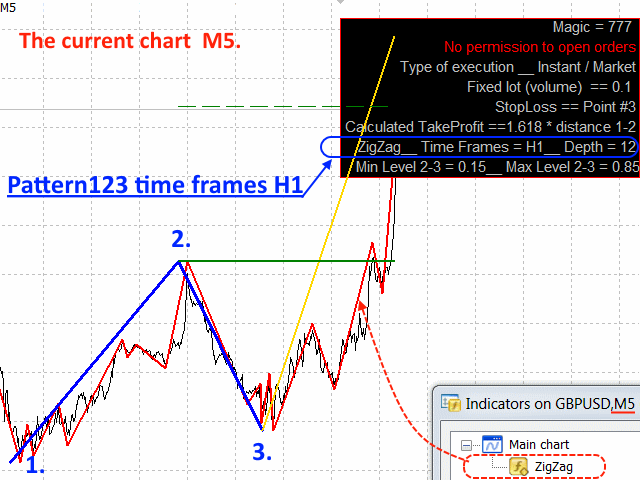 Robot Advisor automatically trades on Pattern 123 of the ZigZag indicator. As a level of unprofitability can use Parabolic SAR. The expert provides a mode of restoring balance after a loss. signal line to the input. You can use a fixed transaction amount. The volume of each transaction can be calculated automatically, depending on the variable "Risk Equity (%)" set in the input parameters. The choice of the type of trade or work only as an indicator. calculation relative to Pattern 123.
allowable shoulder level [2, 3], the size of the shoulder [1,2]. The mode of restoring balance in cases of loss. The magic number - the advisor's identification number can be -1 (minus one), 0 or any positive number. If "The magic number" is zero, then all open or set orders manually adviser will consider their own. If "The magic number" is -1 (minus one), then all open or established orders manually or other adviser the adviser will consider as their own. Buy & Sell - you can set orders and buy , and sell. 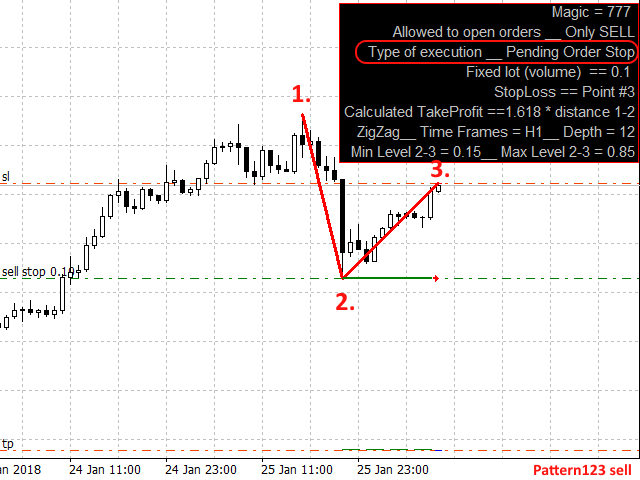 Fixed lot (volume) - the volume of the order to be placed. If "Fixed lot (volume)" is zero, then the calculation of the volume of the order to be set will be calculated automatically, depending on the variable "Risk Equity (%)" specified in the input parameters. With "Fixed lot (volume)" greater than zero, the parameter "Risk Equity (%)" becomes inactive. And the volume of orders to be fixed will be fixed. Risk Equity (%) - the allowable risk per transaction as a percentage of free funds on the account. With increasing risk, profit increases, but the drawdown also increases. 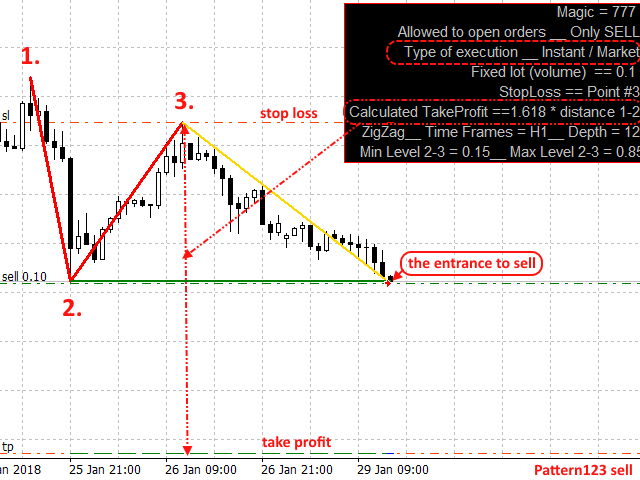 Number - value is used "StopLoss Number"
Point #3 - price point # 3 pattern 123. 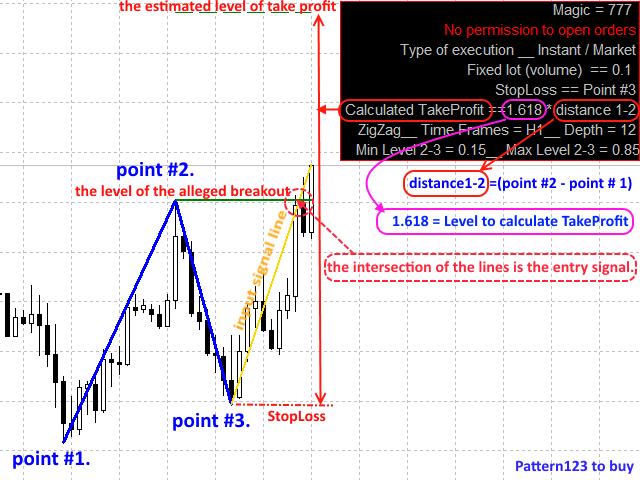 Number - value is used "TakeProfit Number"
Level to calculate TakeProfit - number from 0.001 (it is possible to use Fibonacci levels: 1.000, 1.236, 1.382, 1.618, 1.764, 2.000 and so on ). ZigZag Depth - variable Depth of the indicator ZigZag, value from 5 to 50. 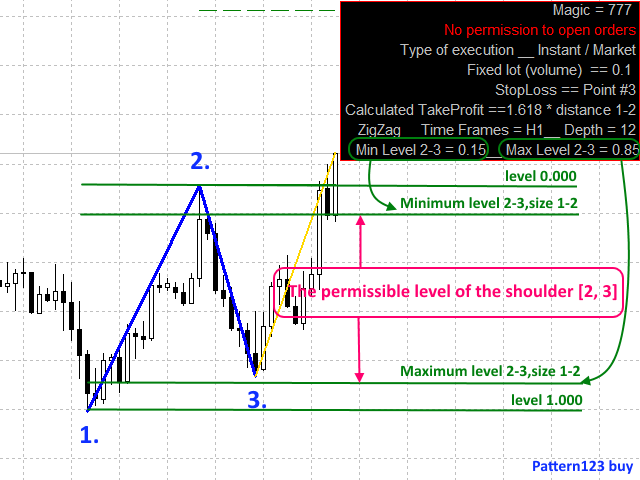 Minimum level 2-3,size 1-2 - the minimum allowable level of the shoulder [2, 3], from the size of the shoulder [1,2]. A number between 0.001 and 0.999. 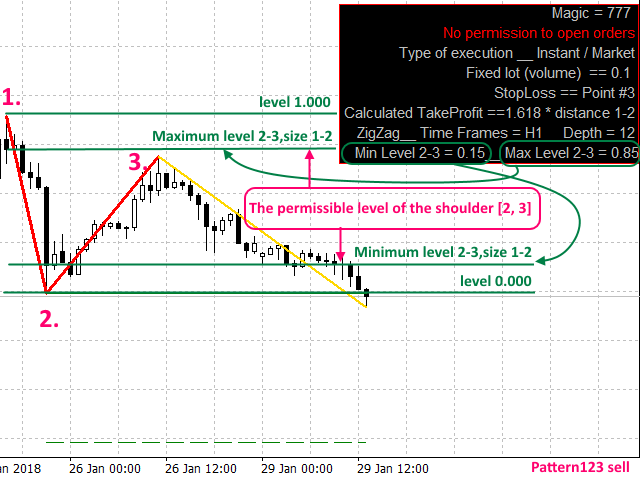 Maximum level 2-3,size 1-2 - the maximum allowable level of the shoulder [2, 3], from the size of the shoulder [1,2]. A number between 0.001 and 0.999. If you have questions or ideas for improving this Expert Advisor, please contact me. "Display information = true" - display information. "Display information = false" - do not display information.